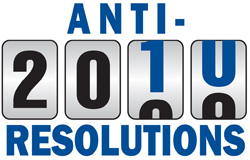 My 2010 Anti-Resolutions – Where Is My Spot? It’s time get the year off to a creative start—and make some resolutions you’ll actually keep in the process. I will not free up room to take in borders by convincing my kids to sleep in more “convenient” places—like the oven or bathtub. I will not try to spice up the Winter Olympics in my house, by convincing each family member that they were adopted from various cold-weather countries. I will not open job interviews by asking if I should have listed my RockBand Drum skills on my resume. I will not try to push day-glo sombreros as the next fashion trend. I will not hang around the seafood section of the grocery store trying to convince the patrons to throw their “catches” back. I will not attempt to create balance in the universe by making only left hand turns. I will not try to addict my kids to crystal-meth in order to take wagers on who can resist the longest. I will not try use my old boxer shorts as material for a “more interesting” type of quilt. I will not try to become famous by faking an Easter Bunny sighting by supplying a fake pelt as evidence. I will not use the ridiculous number of Slurpees I buy as justification to initiate a hostile takeover of the nearby convenience store. Originally posted on where six writers talk about the trials and tribulations of their writing lives. And each Tuesday the soapbox belongs to me.